Server Space is the amount of space you are allowed to use on our server. In this case you are allowed to use unlimited space. Even if you have an existing website this should be more than enough space. Bandwidth is the amount of data you are allowed to transfer per month. Bandwidth allows allows you to deliver your site anywehere in the world for a given month. Email accounts allow you to send messages to one another using your own specialized email. Depending on the domain you use the email will vary. 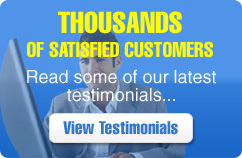 On this plan you are allowed unlimited email accounts. Apache is the most commonly used HTTP server on the Internet. Apache can be used on Windows, Unix, and Linux Systems to handle all internet request. PHP stands for PHP Hypertext Preprocessor. PHP is a server-side, cross-platform, HTML embededded scripting language used by most Web Developers to create Dynamic websites easily maintained by clients, users, and programmers. Perl stands for Practical Extraction and Reporting Language. It is an open source server side programming language, used mostly for processing web forms. Perl scripts are not embeded into HTML pages. Mod Rewrite's are used to modify URL's for a variety of reasons such as Search Engine Optimization. Using Mod Rewrite's allows more user and search engine friendly URL's. Mod Rewrite's also prevents hotlinking and exposure of your inner files. MySQL is a powerful relational database management system that uses the structured query language of SQL. It is widely used and the most popular language for adding, accessing, processing, and deleting data. You can run Windows , Linux or Mac OS on your computer, it doesn't matter. We're fully compatible! Our maintenance plans offer free hosting. So if your company needs a website designed and managed our company can do just that for you.